Maruti Wagon R price starts at Rs.4.20 lakh (Ex-Showroom, Delhi) and the top end variant Maruti Wagon R ZXI AMT 1.2 is priced at Rs. 5.70 lakh (Ex-Showroom, Delhi). 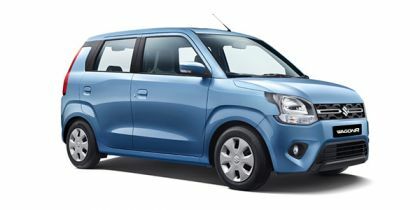 For the first time ever, the WagonR will be offered with a choice of two engine options. First up is the 1.0-litre, three-cylinder engine that makes 68PS of power and 90Nm of torque. The other option is the 1.2-litre, four-cylinder engine that also does duty under the hood of the Swift, Ignis and the Baleno. This engine makes 83PS of power and 113Nm of torque. Notably, both engines will be offered with a manual gearbox as well as an AMT. The Wagon R is also available in a CNG variant as well. This is only available in the LXI and LXI(O) variants with the 1.0-litre engine. Maruti claims a fuel efficiency of 33.45km/kg. The 1.0-litre engine is a 3-cylinder unit which generates 68PS/90Nm on the other hand the 1.2-litre engine is a 4-cylinder unit which offers 83PS/113Nm. 1.o liter means1000 cc petrol engine and 1.2 liter means 1200 cc engine . Q. How is Maruti Wagon R automatic? Some features of new generation wagon r are automatic, like it does not involve clutch it's automated, air bags are automated, screen feature automated, and lock systems, etc. Q. Is automatic Wagon R a successful car? Q. Is it advisable to travel in highway as its have lots of bumps and road grip is not so good when compare to swift?